Having been reading over other teams progress (its a good way of scaring myself into action) I was reminded of how great eBay can be. Team Panda has had some great buys of late, so I thought it was time I had a shop around. 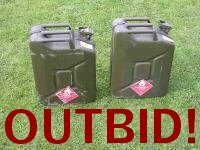 I've manage to pick up two bargins, but was pipped to the post on a third (being outbid with 7 seconds to go is really annoying!). 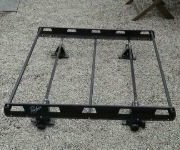 First off, a roof rack for 99 pence. Can't knock that, and secondly a pair of land ladders which retail at over ?80 for ?16. 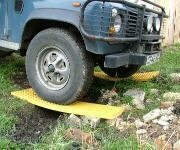 Land ladders are used by off roaders when tackling particularly tricky terrain. They're light weight, flexible and if the can take the weight of about 3 Minis. It would be nice to get a second pair, so that if we encounter some really terrible stretches of Road, we can run continuously, albeit slowly, on these land landers. I spent Sunday carrying out some maintenance and modifications to the car. Now, organised as I am, I thought that I would carry out the essential work on the car first, leaving the lesser items for later. 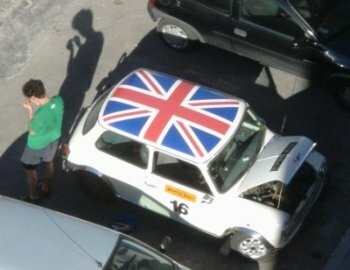 First off I gave the car a thoroughly good wash and then added the Mongol Rally stickers. A simple enough task, but I managed to bodge it completely and as a result, I now have two stickers with hundreds of air bubbles... a good start then. I then added the stickers of all our sponsors however this didn't take to long as we have none. Where should I put that sticker? Next up on the Essential-mods-to-get-to-Mongolia list was the fitting of a twin air horn. Not too much trouble, but the wiring did stump me. What should have been a simple relay setup just wouldn't work. Some of you might remember a nearly catastrophic incident with my old car when bad wiring (on my part) caused an electrical fire. Thankfully the problem this time was just down to a faulty relay, and not my cowboy electrician abilities. Time for some serious work... The exhaust. This was not only blowing on the middle pipe to back box join, but was very loose. Along with repairing this I managed to raise the clearance of the exhaust from 10 cm to 14 (not a huge amount, but it does not protrude anything like it did before). One of my biggest concerns with the Mini is the ground clearance, and in particular that of the exhaust. A bit more work on the rear mount and I should be able to get it higher still. Of late the car has been running a lot hotter than normal. It has an additional cooling fan that enables the car to run without too much trouble in the Madrid heat (40 degrees in the summer), however recently something was obviously not right. Given the standard ?what has changed?? question, I was suspecting that perhaps the water pump had been damaged. A few months back a ?mechanic? over tightened the alternator belt. I thought that perhaps this had over stressed the water pump, leading to the current situation. I decided to test the electical fan before following the damaged water pump route. Running a direct feed to the fan resulted in no movement what so ever. Squeezing into the front wheel arch I tried turning the fan with my hand. It moved, but only just. Something was obviously fouling it. It turned out that one of the flimsy plastic securing strips had snapped, the fan mounting had become dislodged and then jammed against the radiator. I remounted this and made a small metal bracket (made from the left overs of the exhaust bracket modified earlier) to fit the fan more securely. Beyond that I think it is a question of a full service along with minor problems such as fixing the speedo and hazard lights. Oh, and of course the modifications. With only 80 days to go, I am beginning to get a little concerned with our lack of preparation. Therefore in an attempt to scare myself (and my even less prepared team mate) I have prepared the following list of things we need to sort out, buy and prepare... Should be a few fun months then. On top of that that we need to raise the ?1000 minimum for charity (which of course is where you come in).